Juniper Networks works with leading companies around the world to increase the service agility of their networks. 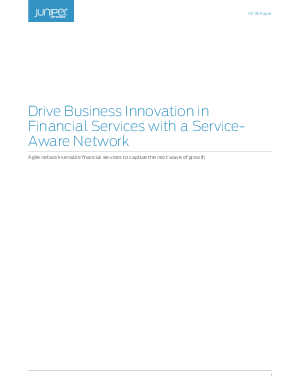 With simple, open, and smart networks, financial services firms can bring innovative new services to market faster and at lower costs. They can leverage Juniper’s expertise, experience, and partner ecosystem to build agile, service-aware networks. Juniper is a leader in high-performance, highly reliable routing, switching, and security, with solutions deployed in some of the most complex networks in the world across banking, capital markets, and insurance providers. A broad ecosystem of solution, services, delivery, and consulting partners can provide businesses with a complete offering that enables innovation.